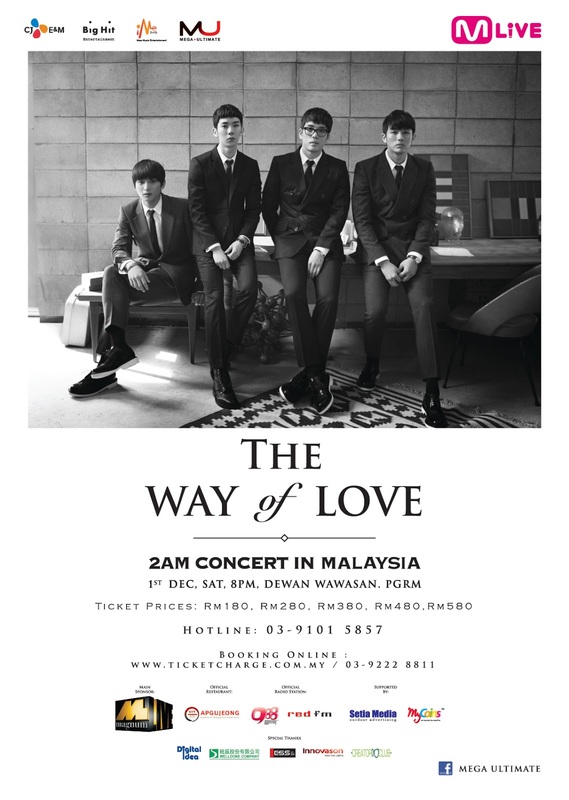 There’s a wow-factor reason to celebrate 1st December 2012 as the hit kpop ballad group, 2AM will hit our shores with their first ever full-scale concert in Kuala Lumpur. Organised by IME & Mega Ultimate, 2AM Live in Malaysia 2012 will kick off on Saturday, 1st December 2012 at Dewan Wawasan, Menara PGRM, Cheras, Kuala Lumpur. Actually the ticket already be on sale at 26th October 2012, 10am until 10pm at Sungei Wang. Grab your tickets now with ticketcharge.com.my / 03-9222 8811 or its outlets nationwide. For more information, please contact 03-9101 5857. In additional catch the exclusive contents of the concert with the official radio stations, 988 and Redfm. I not sure the ticket already sold out or not. But you guys can try looking at ticketcharge outlets around Malaysia.